Menzel G, Heitkam T, Seibt KM, Nouroz F, Müller-Stoerme M, Heslop-Harrison JS, Schmidt T. 2014. The diversification and activity of hAT transposons in Musa genomes. Chromosome Research 22: 559–571. DOI 10.1007/s10577-014-9445-5 and Pubmed link ID: 25377178 And author print hATs in Musa _2014_CR_MenzelEtAlAuthorVersion2014. Sequencing of plant genomes often identified the hAT superfamily as largest group of DNA transposons. Nevertheless, detailed information on the diversity, abundance and chromosomal localization of plant hAT families are rare. By in silico analyses of the reference genome assembly and BAC sequences, respectively, we performed the classification and molecular characterization of hAT transposon families in Musa acuminata. Musa hAT transposons are organized in three families MuhAT I, MuhAT II and MuhAT III. In total, 70 complete autonomous elements of the MuhAT I and MuhAT II families were detected, while no autonomous MuhAT III transposons were found. Based on the terminal inverted repeat (TIR)-specific sequence information of the autonomous transposons, 1722 MuhAT I- and MuhAT II-specific miniature inverted repeat transposable elements (MuhMITEs) were identified. Autonomous MuhAT I and MuhAT II elements are moderately abundant in the sections of the genus Musa, while the corresponding MITEs exhibit an amplification in Musa genomes. 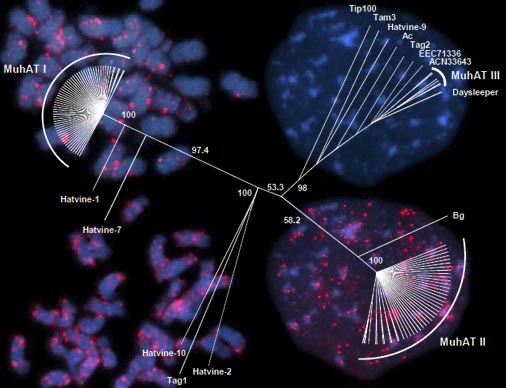 By fluorescent in situ hybridization, autonomous MuhAT transposons as well as MuhMITEs were localized in subtelomeric, most likely gene-rich regions of M. acuminata chromosomes. A comparison of homoeologous regions of M. acuminata and Musa balbisiana BACs revealed the species-specific mobility of MuhMITEs. In particular, the activity of MuhMITEs II showing transduplications of genomic sequences might indicate the presence of active MuhAT transposons, thus suggesting a potential role of MuhMITEs as modulators of genome evolution of Musa. This entry was posted in Musa, Publications, Species and tagged banana, DNA transposons, evolution, genome evolution, genomics, hat, hat elements, heslop harrison, MITEs, musa, NGS, retroelements, retrotransposons, schmidt, TIR, transposons. Bookmark the permalink.